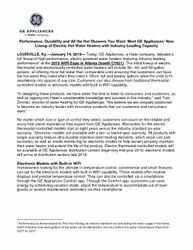 LOUISVILLE, Ky.—January 14, 2019— Today, GE Appliances, a Haier company, debuted a full lineup of high-performance, electric powered water heaters featuring industry-leading performance at the 2019 AHR Expo in Atlanta (booth C7921). 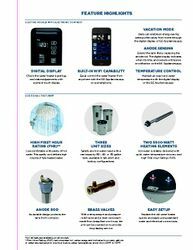 The initial lineup of electric thermostat and electronically controlled water heaters will include 30-, 40- and 50-gallon options, all offering more hot water than comparable units ensuring that customers can have the hot water they need when they need it. Short, tall and lowboy options allow the units to fit seamlessly into spaces of any size. Customers can also choose from traditional thermostat-controlled models or electronic models with built-in WiFi capability. No matter which size or type of control they select, customers can count on the reliable and worry-free owner experience they expect from GE Appliances. Warranties for the electric thermostat-controlled models start at eight years versus the industry standard six-year warranty. Electronic models are available with a ten- or twelve-year warranty. All products with longer warranty feature ultra-durable stainless-steel heating elements, which resist rust and corrosion, as well as anode monitoring for electronic models to help owners properly maintain their water heater and extend the life of the product. Electric thermostat-controlled models will be available at GE Appliances distribution centers beginning mid-year 2019; electronic models will arrive at distribution centers late 2019. Performance as demonstrated by First Hour Rating, an industry standard test simulating hot water usage in the home, which indicates how many gallons of hot water can be delivered in one hour before the water temperature drops from 125°F to 110°F. Homeowners looking for the ultimate in temperature control, convenience and smart features can opt for the electronic models with built-in WiFi capability. These models offer intuitive displays and precise temperature control. They can also be controlled via a smartphone through the GE Appliances Comfort app. Through the Comfort app, customers can save energy by scheduling vacation mode, adjust the temperature to accommodate out-of-town guests or receive maintenance reminders via their smartphone. In addition to the electric heaters, GE Appliances will enter the solar water heating category for the first time with the GeoSpring™ Solar models with Integrated Collector Storage (ICS). The ICS system can efficiently convert and utilize even a small amount of sunshine to quickly generate hot water. Hot water is stored within the panels, making it constantly available to owners, while 24-, 38- or 51-gallon capacities cover nearly all hot water consumption needs. Solar models will be available regionally at distribution centers mid-year 2019.